Creating a winning digital strategy takes the right combination of ‘earned,’ ‘owned’ and ‘paid’ mediaUnderstanding what those are, and how to leverage them to create a successful plan can be confusing. 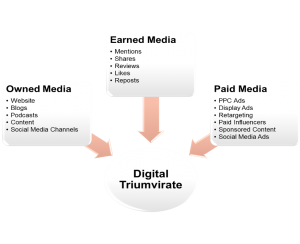 A great way to tackle this is by thinking of earned media, owned media and paid media as a triumvirate. Each is an important part of your organization’s strategy, and combined, they can contribute to a successful digital marketing plan. For the purposes of this blog, we are going to focus on owned media. Owned Media is any communication channel or platform that belongs to your brand that you create and have control over. This can include your website, any content you publish, your social media channels, and the content you distribute on those channels. The cornerstone for any digital owned media strategy is a good website. For many, building a website can be an overwhelming prospect. But building one doesn’t have to be such a monumental task. It’s important to remember that the goal is to build that website, and get your organization online. A website is not a “one and done” project. It is a living, breathing entity that you can enhance and refine over time. What you start with does not have to be your end game. Unlike the catalogs and printed materials of days gone by, your website can be modified quickly and easily as you learn what messaging and design resonates with your audience(s). While goal #1 is getting online, merely creating a website with your name on it will not help you meet your business goals. Make sure you establish clear objectives for what you want visitors to your site to do. It is important to keep your audience in mind as you embark on building your website. Also keep in mind on what you hope to accomplish. The key is to create a site that will attract customers and help you achieve and measure your goals. Not sure what your website should include? Start by talking to your existing customers. Set up some time to interview them; why they chose you, how they found you, and what problems you solve for them. The key is to go beyond the general demographics like age, gender, income and ethnicity. You need to gain better insight into their needs, behaviors and pain points. This kind of exercise is commonly called customer journey mapping. Now that you have a website, the next step is creating content that tells your story. It should connect with your customers and ensure it will be found by your target audiences using search engines. Search engine optimization (SEO) is imperative for making sure potential customers can find your site. (Click here to read our SEO Blog and learn more). High-quality, relevant and engaging content has a significant impact on SEO. And how you rank in search engine results when people are searching for your keywords and search terms. New content published regularly, and relevant content with naturally placed keywords will help your website rank organically. The higher your site appears in the search results, the better exposure and engagement you will have with consumers searching online for content. This content is great for SEO purposes. But it’s also the best way to attract users to the website and keep them engaged and on the site for longer. You may be tempted to create just a homepage with a lead form. Or a contact us button can collect emails and snail mail addresses for future outbound marketing. You will eventually find that your page will have a high bounce rate and very little engagement. You must put yourselves in the minds of your prospective customers; make your content answer the questions that they need answered. A well-planned website with case studies, testimonials, video and a blog all with highly relevant. Engaging content will also attract more users and inspire them to spend more time on the site while visiting multiple pages. Content is what gets you found in online searches. Content that provides value is what people share with their friends and family on social media. And done right, it will generate more leads and more conversions/transactions. In order to reach your target audience, it is vital to listen to your existing audience to identify who and where they are, when they are online, how to reach them, and with the content they are looking for. Social sharing is one of the highest levels of engagement that there is. When your target audiences share content from your website, it means they’ve enjoyed the experience. They want their friends to benefit from it too, or they think your content is so good that they believe sharing it will make them look good. It’s important to make sharing your content easy to do. Have your webmaster install code so all users have to do is click of a button, ensuring that people will be more likely to engage. This will help you amplify your reach and potentially grow your owned audience. In summary, your owned media strategy needs to be focused on delivering the content that your target audience wants. If your content is seen as engaging, educational and/or entertaining, it will sell itself as part of your overall outreach process. Once you have a good owned media strategy in place, adding a paid and earned strategy to the mix will help your business achieve even more of its business goals. Contact Springboard for more information on owned media.